I am quite active on Facebook, taking particular interest in matters of nutrition, as my blog post on 280 Paleo/Primal pages will attest. Susan and I now spend the winter in Florida and I notice something that I first noticed during the year I spend in upstate NY back in the mid-70s. Everything in America seems more extreme than in the UK. It was in Kingston, NY that I first became interested in self-sufficiency and alternate energy and foraging for wild foods. I carried Stalking The Wild Asparagus round in my pocket, and Mother Earth News was my bible. There seemed to be a huge gulf between the log-haired, sandal-wearing hippies who were building earth-sheltered housing and building early prototypes of the Toyota Prius, 35 years ago in their garages, and people driving gas-guzzlers that only did 10mpg, and hacking down forests. When my time with IBM in Kingston was up and I went back to the UK, everything there seemed tame. I couldn’t find the dedicated environmentalists, but we were all driving cars that did 30-40mpg, and insulating our lofts anyway. In the UK the ends of various spectrums seemed not so far apart. It seems the same to me now, but the issues are different. Now it seems to be a battle between Big-Ag and those who would like not to get diabetes, CVD, Alzheimer’s and cancer, and between intelligence and what seems to me, as a part-time outsider, as wilful and celebrated ignorance. Recently a Facebook friend expressed hurt at what was perceived as my attacks on America. I see what I do as a defence of America, so it seemed like time to explain what I was up to. I wrote my friend a letter: “I am not anti-American“. I’d be interested to hear what you think. There’s a really interesting article by David Kushner, in the latest IEEE journal, on the history of the Arduino, including the fact that it got it’s name from a little-known 11th century Italian king, Arduin. What’s the connection? Well, in the town where he ruled there’s a bar named after the king, and that’s where the devlopers of the Arduino hang out. It’s a moot point whether it’s named after the king or after the bar! 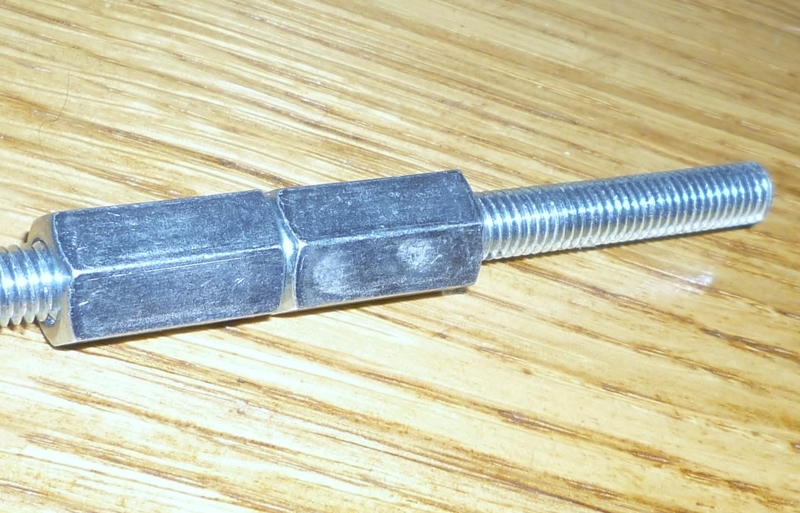 I have been thinking of using M8 studding connectors rather than a single M8 nut on the z-axis lead screws of my 3D printer. My sense is that the x-axis motion would be more stable, and with two connectors, held together in the same plastic piece, it reduces backlash (but I don’t know how to measure that … it just feels like it; I can feel the backlash in a nut, but not in the pair of studding connectors). 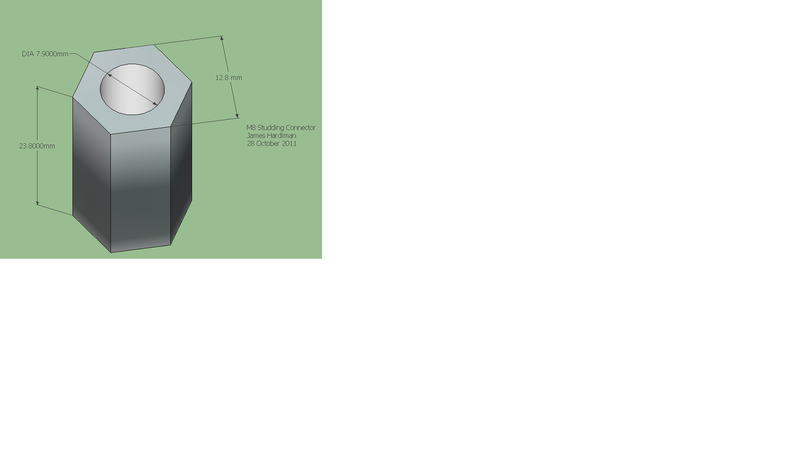 Below is a screen capture of it in Google Sketchup. You can download the SKP file here. The STL file is here. Basically the connector is just an M8 nut that’s 23.7mm thick. Fancy a computer for £15? Then you need to keep an eye on Raspberry Pi, due out in November. … Those who understand binary, and those who don’t. 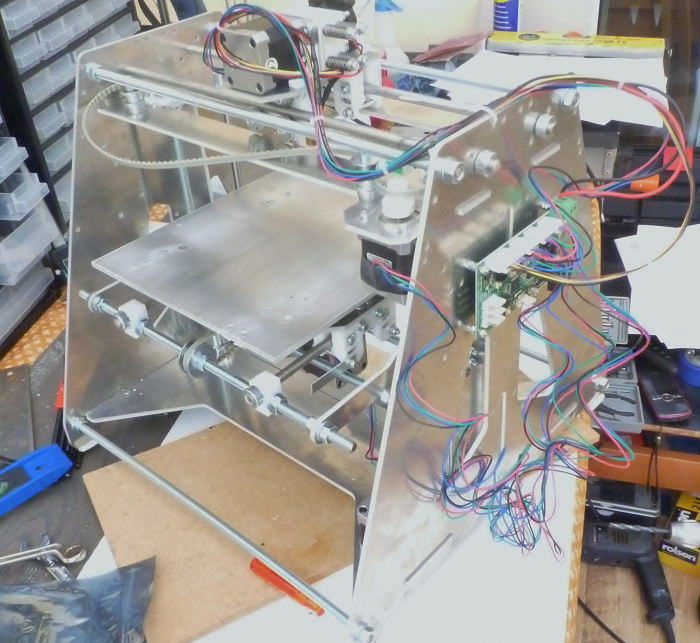 It’s starting to look like a 3D printer! I would be further on, but I discovered MUCH too late that a whole batch of the 624ZZ bearings were faulty. Had to disassemble the whole thing, check all the bearings, and replace the faulty ones. The centre race is a few thou too slim, so when you put a washer either side and tighten it up, it binds on the outer race and won’t go round. Anyone want 60 bearings that won’t go round? Will fire it up tomorrow, hopefully, if I can find my laptop and get it going. Johan has brought out a new accessory for MakerBeam: the Eye Plate. Now I’m trying to work out what I will use it for! I wonder if it would hold a pencil for my simple plotter. Well, here’s an interesting development: plastic ends and vertices for MakerBeam, presaging my own “No Nuts” ideas. Whew! So what to Make now? Well, I’m back in the UK after my totally mind-blowing trip to Eindhoven, and my head is totally spinning. And Susan gives me the heads-up on the state of our finances (grim), so I guess the answer is, today I better make some money! Better get writing, designing, manufacturing, and, most importantly, selling. Today I’m looking at the potential of mini (and, maybe, not so mini) t-slot profiles in the education, prototyping and just general Making markets.